Orbis jewelry is a unique line of interchangable jewelry created by U.S. designer Ron Hartgrove. Each piece of jewelry comes with six different natural stone spheres so the purchase of a single ring gives the wearer six color options. In addition to that, there are over 1000 different spheres available in all types of different materials. Jewelry items include rings, bracelets, pendants, and earrings available in all sterling silver, sterling silver and 18k gold, all 18k gold and platinum, with or without diamonds. With over 350 styles to choose from we know you will fall in love with more than one. Prices are available for any budget. Starting at only $165.00 for a sterling ring including the 6 spheres, sterling and 18k start at $495.00 and platinum and diamond starting at $2,085.00 up to $9,750.00. Additional spheres start at only $15.00 each with hundreds available under $50.00. 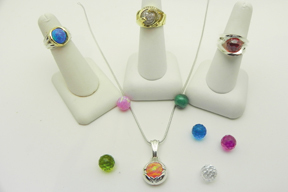 Specialty designer spheres in platinum and diamond are also available. Each ring is registered and a wish list filled out by the customer so family members can surprise their loved ones with their favorite spheres. Rings are even available for men. Sayers is the only place to obtain Orbis in Delaware and as of this last December we are proud to say we are the number one retailer of Orbis in the entire U.S. or the World for that matter. 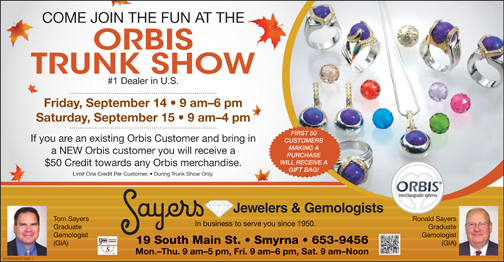 Visit us during the Orbis Trunk show and see everything the company makes at one time in one place and share in the many other surprises and drawings for that event. 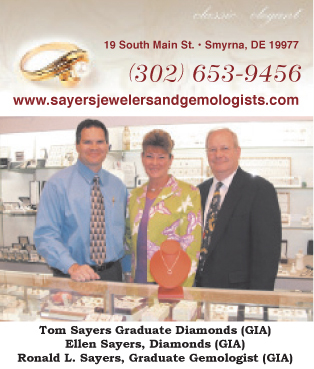 Sayers was started in 1950 by Leroy and June Sayers at 19 S. Main Street in Smyrna. Now in its 63rd year and 3rd generation it is now Sayers Jewelers and Gemologists. Still in the original location it has expanded seven times over the years and at present has customers in 48 states. 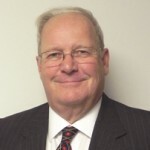 Ron and Ellen Sayers have been in the business full time for 45 years and son Tom for 17 years. Together with the rest of their bench jewelers and sales staff, you have the benefit of over 199 years combined experience at you service. Ron is the only independent jewelry store owner in Kent County to be a Graduate Gemologist from GIA. Son Tom is also a GIA Graduate Gemologist and three other employees have GIA diplomas. This training an experience is unmatched in the area. The customer benefit is: Sayers hand picks every loose diamond for engagement rings and the jewelry that they make. Diamond customers are educated about the merchandise and shown the many options they have to choose from as well as seeing their diamonds in the gem microscope. Sayers specializes in the finest ideal cut diamonds from Lazare Kaplan as well as the very limited production Forever 10 diamonds, two of the most brilliant diamond cuts in the world. All restoration and service work is carefully done on the premises by trained professionals. Ron and Tom Sayers, along with Alan, meticulously create hundreds of custom one of a kind jewelry items each year using the most high tech laser welders and CAD CAM equipment available to the industry as well as the traditional hand carved waxes. Sayers designers work with platinum as well as 14k and 18k gold and silver which is cast and assembled in our own studio on premises. Sayers stocks fine jewelry from leading designers such as, Lazare Diamonds, Forever 10 diamonds, Richard Krementz Gemstones, Lorenzo, Frederic Duclos, Pandora, Frederic Sage, and Orbis to name a few.